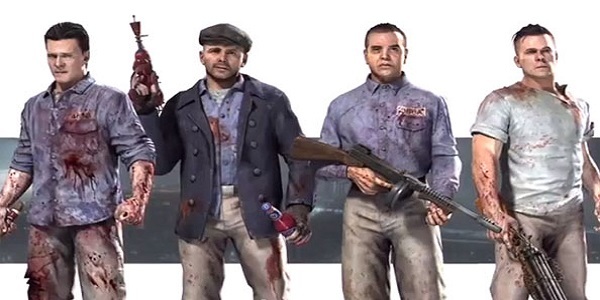 If you own the 360 version of the game, then you're likely already familiar with Billy Handsome, Al "The Weasal" Arlington, Salvatore "Sal" DeLuca, and Michael "Finn" O'Leary. If you own the game for PC or PS3 and have been eagerly awaiting that May 16 date for the DLC to drop, then here's a chance to get to know these wise guys a little better in the latest character trailer. In addition to the game's upcoming release for the PS3 and PC, fans will be able to pick up the soundtrack to the Mob of the Dead mode on Amazon, iTunes, Spotify, Google Play, and let's just say any place where digital media is sold. You'll get 24 tracks that are from the zombie expansion itself, and a couple of bonus tracks from previous DLC offerings, Tranzit and Die Rise.